I just added Blue Sky Flights to our Attractions page and I was so impressed I thought I’d blog about it too. For more info go to ‘Things To Do’ and scroll down to Attractions. If you have a moment to watch the video of the couple that got engaged in the air it’s worth it. How romantic. But don’t let that make you guys feel bad as this is a romantic gesture without a ring! There are so many great shot and a beautiful video too. And if you’re like me who paused the video to see if you could recognize places then you might enjoy staying with us in ‘Saltwinds’ also referred to as the ‘Map Room’. We have a huge aerial photo of the island. This is the perfect way to see the island and fly overhead the main points of interest (down along South Shore beaches, overhead Paradise Lakes, and back overhead Hamilton and Flatt’s Inlet), as well as get an introduction to the adventure of flying in a small plane. Flight Time: 30 minutes (including takeoff and landing). Allow for 1 hour at the airport. Cost: $250. Full-Length Sightseeing Tour longer tour allows us to explore and fly over the whole island – all of the above, plus some spectacular cliffs and stunning turquoise reefs off of the west end of the island, shipwrecks such as the Vixen, Dockyard – and circle overhead any points of interest you’d like (beaches, forts, your house/hotel), while flying slightly slower than the Discovery Tour to allow you to take stunning photos. This is our more popular option. Flight Time: 50 minutes (including takeoff and landing). Allow for 1.5-2 hours at the airport. Cost: Sept 1 – May 30: $450. June 1 – Aug 31: $500. Includes: 2 adults, or 1 adult and 2 children, subject to a take off weight restriction (450 lbs (204 kg) combined for all passengers). All taxes and fees included. Gratuities not expected or required, but always appreciated by our hard-working pilots. This is an experience not to be missed, and your VIP GUESTS, CLIENTS & EMPLOYEES will come back raving about their adventure. It makes for a fantastic social media op, and a uniquely memorable form of recognition from your company. Our Guest Lounge is available to accomodate small groups of 5-10, who can mingle and use our complimentary wi-fi between flights. See more SPECIAL EVENT OPTIONS listed below. To discuss your custom tour package, please email us or call Heather at (441) 516-3305. 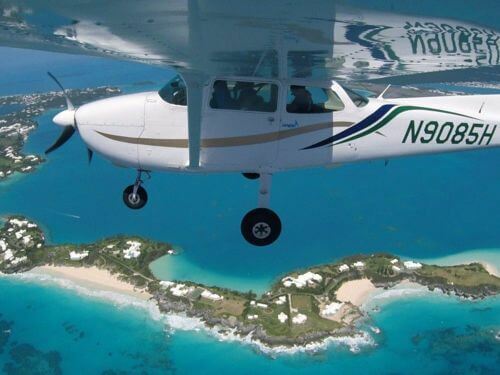 A PROPOSAL BY AIR while flying overhead Bermuda, is possibly the most memorable way to make a grand romantic gesture. We can arrange all of the details, such as: Pre-made (and successfully used) letters to write ‘Marry me’ on the beach of your choice | Champagne toast on landing | Photos and video from the wingtip and from the dash to record the reaction of your flight provided digitally | We welcome any other ideas you can imagine! | You can involve your family and friends, to arrange things on the beach and we can signal them with the ‘yes’ by flashing our lights. 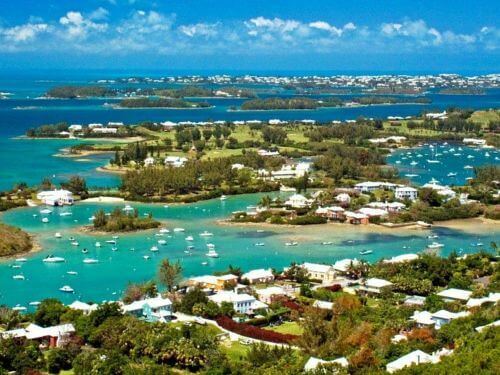 Our tours are the most unique and adventurous sightseeing option in Bermuda. Perfect for your WEDDING PARTY/GUESTS to remember this experience forever. They’ll be able to see the whole island and points of interest like the wedding or reception venue. Our Guest Lounge is available to accommodate small groups of 5-10, who can mingle and use our complimentary wi-fi between flights. SPECIAL EVENT OPTIONS: Lunch and refreshments | Champagne toasts on landing | High-res photo booth images | Digital flight video | We welcome any other ideas you can imagine! | To learn more about our fully customizable sightseeing tours, please contact us today.